The following text was contributed by the Government of Georgia. Georgia welcomes the launching of the Open Government Partnership and joins the aspirations of participating countries in making their governments more transparent, accountable, innovative and open to citizen participation. The cornerstone principles of the Partnership have been on the agenda of the Georgian government long before the OGP. Since the Rose Revolution of 2003 all-embracing and successful measures were implemented to fight corruption, completely alter the mindset for the public service delivery and increase the professional integrity among civil servants. From being one of the most corrupt countries in Eastern Europe by 2003, now Georgia has 4% corruption perception among its citizens, only 2% have experienced bribery and 77% of Georgians are satisfied with government’s actions towards fighting corruption. Georgia’s existing political system is based on openness, citizen involvement, transparency and cooperation with civil society. Most advanced and sophisticated technologies and innovative tools are used in all fields of governmental activities. 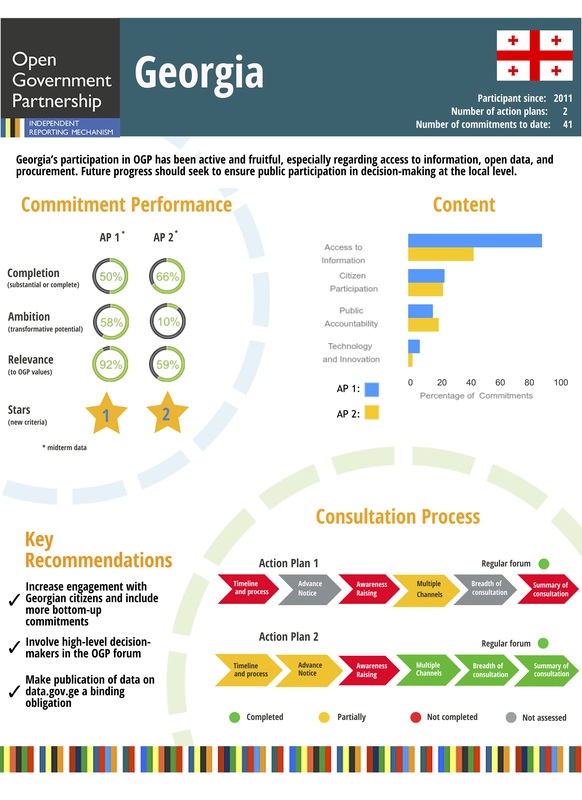 The OGP is an excellent opportunity for Georgia to move beyond current achievements, undertake new commitments and share experience with the partner countries. The Georgian Action Plan is the result of thorough consultation process with local and international NGOs, students and academia throughout the country. Life in Transition Survey, EBRD, 2011; Transparency International’s Global Corruption Barometer 2010.